The 15 watt solar spotlight is a great and efficient way to light up a dark area. This light is a great solution to dark parking lots, pathways, etc. This aluminum alloy lamp will charge to full capacity at 7 hours on a sunny day. The discharge time is 12 hours at full power and more than 20 hours at half power. The light will turn on automatically at dusk. Recommended mounting height is 13 to 16 feet, and recommended space between lights is 30 to 50 feet. The light burns at full brightness when there is motion, and then will run at half brightness when there is no motion. We recommend using an iron or steel pole that is 13′ to 16′ and are 2″ to 3.5″ in diameter, and at least 2mm thickness. Aluminum poles that are 12 gauge or lower are also adequate. 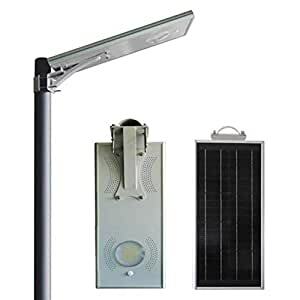 Product Specifications: 1 Year Warranty, 1100 Lumens, Lithium Battery, Total Operating Time is 12 Hours On A Full Charge, Size is 25″ x 13″, Mounting Hardware Included, Pole Not Included.